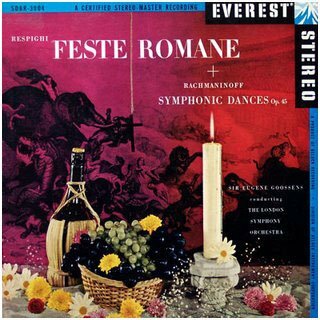 LISTENING NOTES: Everest's Expansive "Feste Romane"
Since we were on the subject of Everest and Sir Eugene Goosens, I wanted to bring another early Everest recording to your attention. This was Everest's forth release from 1958, and like it's Corroborree by the same forces, it is a sonic spectacular. In fact the engineers were so pleased with the awesome dynamic range captured on the tape, that a highly unusual decision was made. Rather than limit the dynamics, as they would have to be compressed to fit on a single disc, it was decided to spread the work over three sides, allowing the earth shatteing dynamic range that was present on the master tape to be fully realized on disc. The Rachmaninoff "Symphonic Dances" was selected for Side Four, filling out this two record set. Was the effort and expense worth it? It's a bit hard to say. Unfortunately I do not have a first pressing (turquoise and silver label) and for years I had only a later black label pressing, which was ok, but was pressed on noisy vinyl. I later was fortunate to find the second pressing which has a magenta and gold label design. These second pressings, like the first, were also made by Everest's parent corporation Belock Instruments, under the supervision of Harry Belock, who's passion for music inspired him to start Everest Records. All other label variationa were done out of house, and the quality varies from good to poor. With the Belock pressings, I can hear what all the excitement was about. Feste Romane is a tremendous score, with overpowering climaxes and a heart-stopping dynamic range. Although it was later surpassed most notably by the incredible Decca recording by Maazel (also available in a spectacular half-speed mastering on Mobile Fidelity), I still have a fondness for this groundbreaking record and hope to see it reissued, now that Classic Records has started releasing more of the Everest catalog on 200gm vinyl. How about it, Classic? Recommended!